How we use engagement on social media to gain hundreds of real, authentic followers and turn them into customers. The purpose is right there in the title, “Social” Media. As a business or an individual, you’re on social media because you want to build and maintain relationships, keep in touch with friends and family, and create an online community that supports you and is engaged in what’s happening in your life. For a personal account, that’s natural. You’re commenting on baby photos, sharing details about your recent vacation, and finding old friends from high school. You like, you comment, and you interact. So how do you check those “social” boxes as a business? Let’s be clear, I’m not telling you to shift all of your personal stuff over to your business page. “Personal” and “social” can often get blurred and that needs to be managed closely to walk the line of professional, but relatable. Occasionally you might drop a photo of your granddaughter wearing company apparel, but primarily, we want to keep the personal stuff at arm’s length. What I’m telling you is to do all of the liking, commenting, and engaging that a person would, and do it intentionally. Being social as a business is all about engagement, and engagement that feels real. Let’s start with Instagram. We all know that Instagram is about modern content, great photos, and getting that like from our followers. There is so much more to succeeding on Instagram than just posting photos. When was the last time you liked and commented on other photos as your business account? It should happen every day and if that’s too much, at least a good chunk of time right after you make a post. Like the posts of businesses and people in your feed, like the recent posts of your followers, comment on posts of people who like your posts, and just keep liking and commenting. If I wasn’t clear there, I want you to engage with just about every post you see on Instagram, but not just what appears in your feed. Let’s talk a bit more about what to like/comment on and how to find those posts. The obvious place to start is your feed. 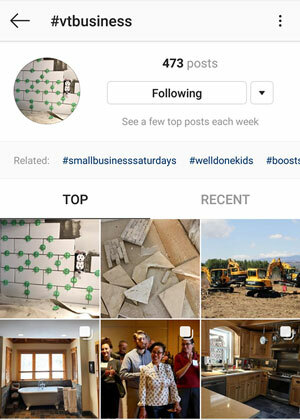 When you’re scrolling through Instagram, you’re seeing primarily posts from the accounts you follow and a scattering of ads and boosted posts from other accounts. Like ‘em all, and I really mean it. The trickier part is making sure you like the posts not only of the people you follow, but the people that follow you. Just go to your account, click on Followers, and click through that list. You can follow them back or you can just go to their page, like 1-3 of their posts, and move to the next person. This is a huge step in making sure your post gets seen by your followers. Scratch their back and they will scratch yours. The final step in liking everything in sight is finding new accounts that you don’t follow, and that don’t follow you. This is where hashtags come in handy. Now, I’m not going to dive into the use of hashtags to promote your posts, but if you want more info on when and how to use hashtags on social media, let me know in the comments and we’ll be sure to cover that in another post. For now, I’m just going to talk about using hashtags to find new accounts and posts to engage with. Did you know you can follow a hashtag? If you search a hashtag relevant to your business like #vtbusiness or #marketing or #toystore or #bedandbreakfast you will see the posts that have been tagged with that hashtag. You can actually “follow” that tag the same way you would an account and then any post using that hashtag will appear in your feed. This is a huge way to diversify what accounts you’re seeing and interacting with. If there’s a hashtag that’s related to your business or in a segment you want to get more followers from, just search the hashtag, like a ton of posts, and go about your day. No need to follow every hashtag, it’s just a good way to find new accounts and build new relationships. You never want to get stuck where your account is only being seen by the same people every day. That’s not going to help you grow. Let’s step away from Instagram and talk about Facebook. This is a huge one, and most likely the primary social media platform for your business. 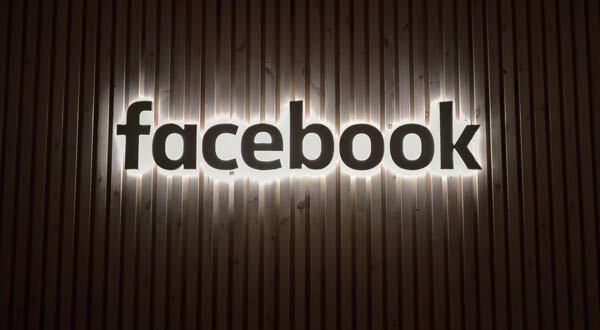 Facebook has exploded for businesses and with options to boost posts and buy ads for such low prices, it’s an incredible place to put some focus. Now, buying ads and boosting posts is huge, but we’re talking about the “social” part here. If you want some more info on Facebook boosting, leave a comment or give us a call because man, we love boosting things on Facebook. So, back to the “social” part of Facebook. No offense to MySpace and platforms of yester-year, but Facebook really defined social media and propelled its consuming role in our culture and business models that we see today. It has replaced websites for some businesses (not recommended but hey, if it’s working for you keep at it) and is one of the first places people search for info on businesses. You know Facebook is important, so how do you embrace being “social”. Facebook is the same tune, different story. You need to be commenting, liking, and engaging, but not quite in the same way as on Instagram. There’s certainly some room to like the posts of other pages on Facebook, but your big focus should be on maintaining engagement on your own posts and page. That means replying to every comment you get on your posts and responding to any messages that comes your way. Let’s start with replying to comments on your posts. Social media platforms all have crazy algorithms that control who sees your posts, when they see them, and how many people see them. It’s not all as natural and organic as you’d like, but in the most basic way possible, the more comments and likes you get on a post, the more people Facebook (and Instagram for that matter) is going to show your posts to. One way to make the most of those comments: like and reply. Facebook comments can be questions about your businesses, general feedback like “looks great” or even negative comments and experiences. Reply to them all and do it in a way that looks real. It used to be pretty common for businesses to reply with a canned response like “send us a message and we’ll talk about it privately”. That is not what we want to do in the year of 2019. People want transparency and moving a conversation to your messages makes it look like you have something to hide. If it’s a simple “thank you”, an answer to their question, directing them to your website, or responding to an issue or concern, do it publicly, respectfully, and promptly. In summary, if you get a comment, reply to it. Next up on Facebook, let’s talk about messages. Now, people can DM (direct message) you on Instagram as well, but it’s much more common on Facebook and it’s a bit more involved. Facebook has all kinds of badges it will add to your page if you’re doing well with the “social” part and having the “fast responder” badge is definitely something you want. 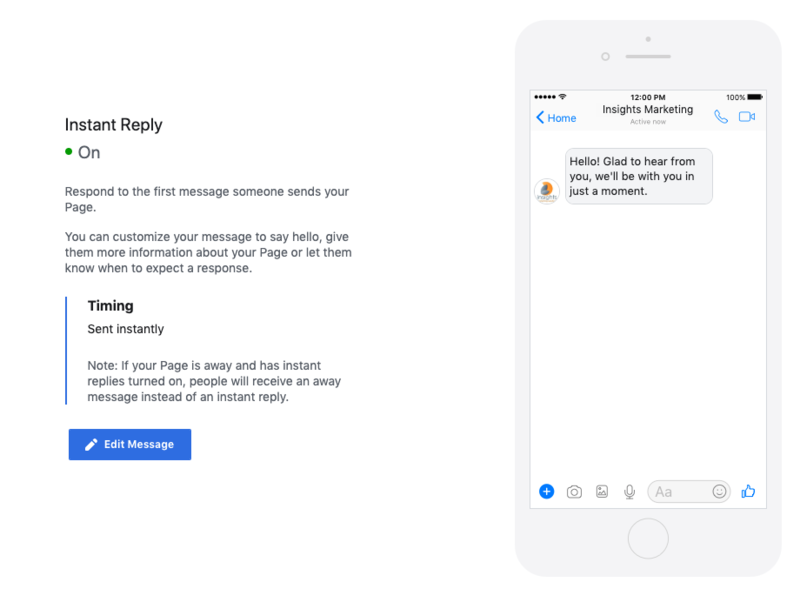 Facebook will expose you if you only reply to half of your messages and it will lessen the likelihood of potential customers and clients reaching out to you if they see that you typically don’t respond promptly. We can’t all be glued to our Facebook pages, so what do we do? Let’s talk about “auto-responders”. If anyone messages your business page, you should have an auto-responder that lets them know you’re busy and you’ll be with them soon. A quick, “Thanks for reaching out, give us a few minutes and we’ll be back to chat” helps the customer feel valued and adds an extra dose of patience while they wait for you to actually get to them. The auto-responder looks just like a message, so make sure it is vague enough to make sense no matter what their message said. Oh and don’t worry, if they send multiple messages before you get to them, the auto-responder knows what’s happening and will not keep sending over and over again. Facebook is pretty smart like that. Ok, let’s hit one last tip before we go and this one is a bit of a dirty little secret. It’s something that needs to be done delicately, but you know, sometimes you gotta do what you gotta do to get the attention your business deserves. Here’s what I’m talking about: Comment on other people’s ads and boosted posts from your business page. 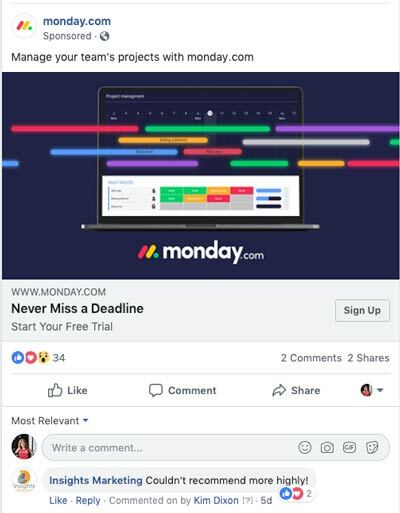 I know, it’s sneaky, and you don’t want it to look like you’re trying to snag business away from your competitors so be careful how and when you do this, how often you do this, and what kind of comment you leave. But listen, that post or ad has been boosted. It’s going to be seen by hundreds, thousands, millions, who knows how many eyes, and you didn’t pay a dime of it. Let’s just piggy-back on that and get some views for free, right? See the difference? On the bigger businesses, you can be bold and your comment can directly talk to other people in the comments who might see the post. For a smaller business, comment as though you’re talking to the company do not under any circumstances write something that suggests you’re trying to steal their business. It’s a tricky one, but it can be a useful way to get your business name in front of new eyes and build some local connections. Here’s what I want you to remember. Social media needs to be “social” and that comes from interacting and engaging. 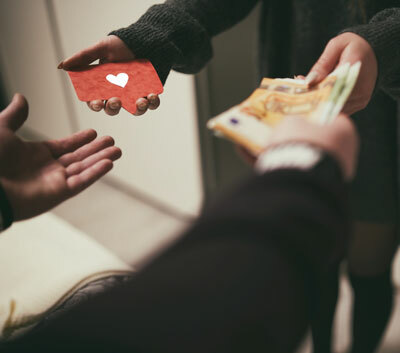 This builds loyalty, increases the likelihood of people engaging with your content repeatedly, and will give you a great boost in word-of-mouth. It’s really not all about just keeping people happy. Engagement is how social media platforms quantify the value of your posts and your account. They look at how many people interact with you, but they also really care about who you interact with. If you want to succeed on social media, you absolutely must do more than just make posts. You need to engage and you need to make it a priority. I get it. Business owners are busy enough as it is and social media can feel like a never-ending burden. If you’re not sure exactly who to engage with on social media, what to post, or you feel like you’ve tried everything and just can’t figure it out, give us a call or drop us a line. We can build a schedule, train you in more detail, or just take it off your plate completely.